Our 1 Day Transfer picks you up from your Alice Springs accommodation at 5:30am and drops off at either the Ayers Rock Airport (Uluru) or the Yulara - Ayers Rock Resort at approximately 11:30am. Enjoy this overnight tour of Uluru (Ayers Rock) and Kata Tjuta (Olgas) departing daily from Ayers Rock Airport or Ayers Rock Resort (Outback Pioneer). 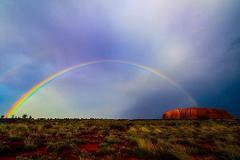 This tour includes Uluru Sunset, Sunrise, the Base walk and Kata Tjuta walk. 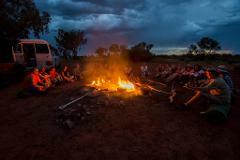 The Rock Tour "3 Day Uluru" is a Camping Tour that departs every day from Alice Springs at 5:30am. 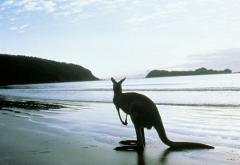 This is an energetic tour that includes Uluru (Ayers Rock) Sunset & Sunrise, Kata Tjuta (The Olgas) and Kings Canyon. All meals are included. 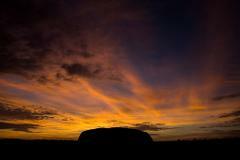 The Rock Tour "3 Day Uluru" is a Camping Tour that departs every day from Ayers Rock (Uluru). 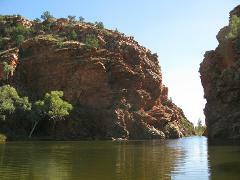 This is an energetic tour that includes Uluru (Ayers Rock) Sunset & Sunrise, Kata Tjuta (The Olgas) and Kings Canyon. All meals are included. 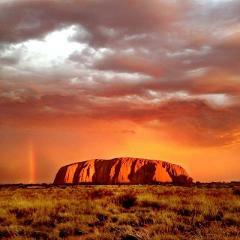 The Rock Tour "4 Day Uluru" is a Camping Tour that departs daily from Ayers Rock (Uluru) at 12pm. This tour includes Uluru Sunset & Sunrise, Kata Tjuta, Kings Canyon & 1 night in Alice Springs plus a transfer bus back to Ayers Rock (Uluru). 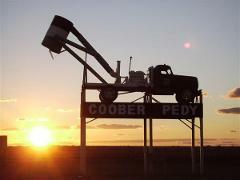 The Rock Tour "5 Day Uluru to Adelaide" includes the 3 Day Rock Tour starting from Ayers Rock (Uluru) Airport. Spend 1 night at the YHA Alice Springs in a dorm room. Followed by the Greyhound bus from Alice Springs to Adelaide. The Rock Tour "5 Day Cairns to Uluru" includes the Greyhound bus from Cairns to Alice Springs, 1 nights dorm accommodation at the YHA Alice Springs when you arrive. Followed by the 3 Day Rock Tour camping trip. The Rock Tour "5 Day Adelaide to Alice Springs (including Uluru)" includes the Greyhound bus from Adelaide to Alice Springs, 1 night accommodation at the YHA Alice Springs, Uluru Sunset & Sunrise, Base Walk, Kata Tjuta & Kings Canyon. 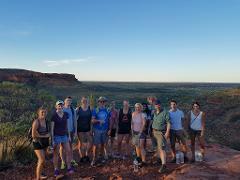 The Rock Tour "5 Darwin to Alice Springs (including Uluru)" includes the Greyhound bus from Darwin to Alice Springs, 1 nights accommodation at the YHA Alice Springs (6 share), Uluru Sunset & Sunrise, Base Walk, Kata Tjuta & Kings Canyon. 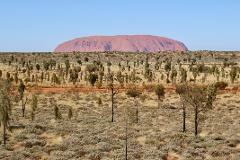 1 day tour to Ayers Rock (Uluru) and the Olgas (Kata Tjuta). The tour only departs 4 times a week (Mon, Wed, Fri & Sat) from Alice Springs at 6:00am and returns to Alice Springs at midnight. 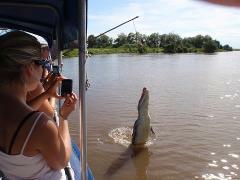 Enjoy a 1 Day Tour to the Litchfield National Park which includes the Jumping Crocs on the Adelaide River. Stay 1 night in the local hostel. On Day 2 go on a 1 Day Tour to the Corroboree Billabong and visit Wetlands, Birds & Crocs. 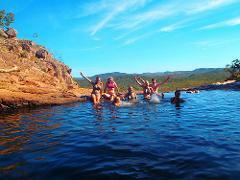 The Rock N Palms Tour includes a day tour to Palm Valley , 1 night accommodation at the YHA Alice Springs (6 share dorm). Along with the 3 days / 2 nights Rock Tour. The 5 Day Best of The Red Centre includes a 1 day tour to Palm Valley plus the 1 day tour to the West Mac Donnell Ranges, 2 nights accommodation at the YHA Alice Springs (6 share dorm). Along with the famous 3 days / 2 nights Rock Tour. "The 6 Day Rock to Mines package" includes the 3 days / 2 nights Rock Tour, 1 night at the YHA Alice Springs (dorm) Greyhound bus to Coober Pedy, 1 night in the Underground Hostel (dorm), Opal Mining Town Tour & Greyhound bus to Adelaide. Take a hot air balloon ride is the perfect way to appreciate the vast remoteness and spectacular dawn colours of the Australian outback. Includes the 3 days Rock Tour, 1 night at the YHA Alice Springs (dorm) Greyhound bus to Coober Pedy, 1 night in the Underground Hostel (dorm), Opal Mining Town Tour, Greyhound bus to Adelaide, 1 night at hostel plus 2 days Kangaroo Island. Experience the thrill of a tandem skydive at Uluru (Ayers Rock) for a once-in-a-lifetime experience at one of Australia’s most iconic sites. The Rock Tour "7 Day return package from Adelaide to Uluru" includes return Greyhound bus from Adelaide to Alice Springs, 2 nights dorm room at YHA Alice Springs plus the 3 day Rock Tour to Uluru, Kata Tjuta and Kings Canyon. The Rock Tour "7 Day package starts from Adelaide and finishes in Darwin" includes the Greyhound bus pass, 2 nights dorm room at YHA Alice Springs plus the 3 day Rock Tour to Uluru, Kata Tjuta and Kings Canyon. The Rock Tour "7 Day package starts from Darwin and finishes in Adelaide" includes the Greyhound bus pass, 2 nights dorm room at YHA Alice Springs plus the 3 day Rock Tour to Uluru, Kata Tjuta and Kings Canyon. 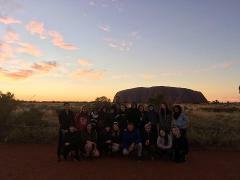 The Rock Tour "7 Day package from Cairns to Uluru to Adelaide " includes the 7 day Whimit pass with Greyhound Australia, 2 nights dorm accommodation at the YHA Alice Springs plus the 3 Day Rock Tour to Uluru, Kata Tjuta and Kings Canyon. 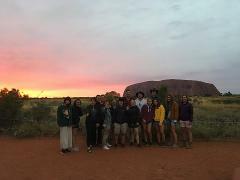 The Rock Tour "7 Day package from Cairns to Uluru to Darwin " includes the 7 day Whimit pass with Greyhound Australia, 2 nights dorm accommodation at the YHA Alice Springs plus the 3 Day Rock Tour to Uluru, Kata Tjuta and Kings Canyon. 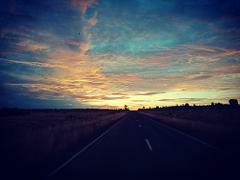 The Rock Tour "9 Day package starts from Melbourne and finishes in Darwin" includes the 2 day Great Ocean Rd & Grampians, Greyhound bus pass (7 day Whimit), 4 nights dorm room plus the 3 day Rock Tour to Uluru, Kata Tjuta and Kings Canyon. The Rock Tour "7 Day return package from Darwin to Uluru" includes return Greyhound bus from Darwin to Alice Springs, 2 nights dorm room at YHA Alice Springs plus the 3 day Rock Tour to Uluru, Kata Tjuta and Kings Canyon. 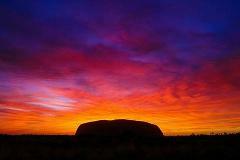 The Rock Tour "5 Day Uluru to Darwin" includes the 3 Day Rock Tour starting from Ayers Rock (Uluru) Airport. Spend 1 night at the YHA Alice Springs in a dorm room. Followed by the Greyhound bus from Alice Springs to Darwin. The 8 Day Rock to Croc package from Ayers Rock (Uluru) to Darwin includes a 3 days / 2 night Rock Tour, Greyhound bus from Alice Springs to Darwin and a 3 4WD Kakadu Tour.